In deciding on a cover for Guess What’s in My Garden! I chose to show my favorite garden whimsy: the Phrog Philharmonia. It started over a decade ago when I saw a guitar playing frog in a home and garden shop in Asheville. I wanted it but decided it was way too expensive. Should I be surprised when my three daughters found out about the frog and gave it to me for my birthday? The frog played the guitar alone in my garden until I bought a frog playing a sax and then one with a French horn; I now had a trio. Over time I’ve added a trombone, flute, percussion, and a frog cowboy on second guitar. Some were quite expensive works of art and others were bargains. But they make wonderful harmony together. I found three kittens with microphones and they became my front singing group…Millie, Billie, and Lily…the Kitty Sisters. Sadly they rusted away but have been replaced by the Butterfly Girls Trio. My grandson Adam was apparently paying attention: he spied the wide mouth frog at the Good Will. He knew how much I would like it and spent $1 of his own money to get it for me as a special birthday present. 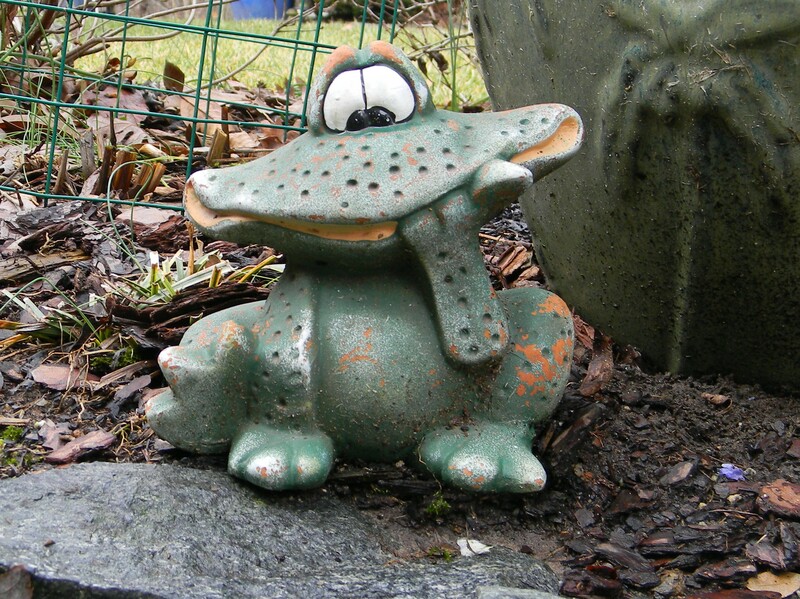 I placed the wide mouth frog so Adam can’t miss it when he enters the garden. I don’t see a loony, grinning frog with its tongue hanging out; I see my grandson and his love for me. I smile a lot. Image | This entry was posted in Uncategorized and tagged frog, Phrog Philharmonia, whimsy. Bookmark the permalink.